I love mushrooms. I can eat them raw, sauteed in butter by themselves, cooked up with bacon, perched atop a thin crust veggie pizza (yum! ), paired with tender chicken in a creamy sauce…you get the picture. 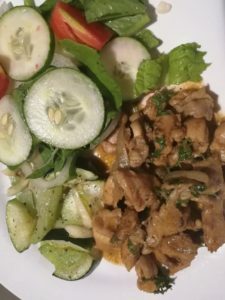 Typically, mushrooms in Jamaica are premium offerings, imported and resold at high prices in the more upscale supermarkets. 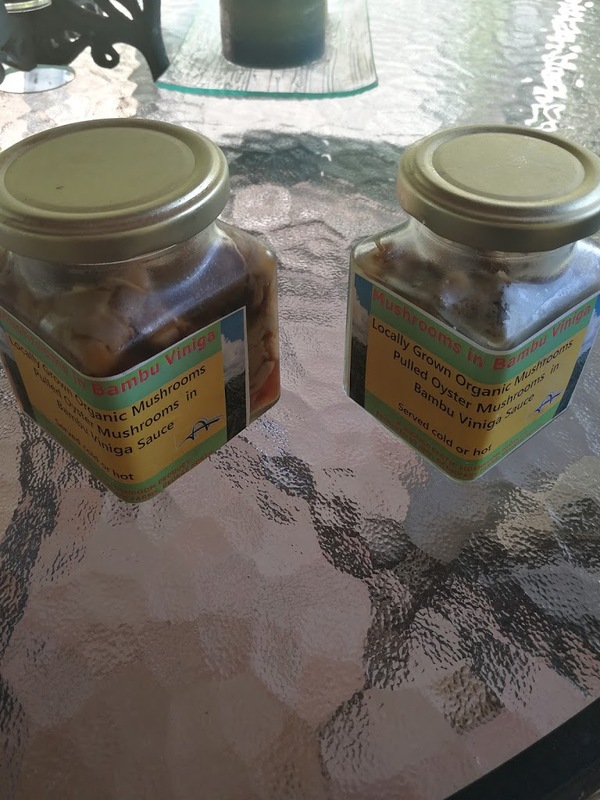 But in the early ’90s, there was a local project that saw oyster mushrooms produced by small farmers in rural Jamaica available on supermarket shelves. They were different from the typical button and portabella mushrooms that I was familiar with, but they were half the price and they were fresh and I lived for the times when they made their appearance. I can’t recall the details on the project that brought this exotic food local. It could have been RADA or JADF (Think inland shrimp farming, ornamental fish rearing, bee keeping,small farmer orchid production in Yallahs, cassava and tobacco farming, greenhouse agriculture…some of the more well known agriculture based projects that were initiated with the aim of transforming lives & communities. Too bad scaling up seems to elude us. I stand to be corrected). They soon ceased to be available, much to my dismay. There’s that scaling up issue again. Over the years I have mourned their absence until a few weeks ago when I stumbled across an article in the local papers signalling a new project and the availability of locally produced oyster mushrooms again! Oh happy day! I immediately went to the Facebook page indicated in the article and enquired. Production was happening in Manchester. Were they available in Kingston? Where? How much? I eventually got a response stating that deliveries were going to be made in Kingston on Nov 16, please place orders at a specific email address. So I did. The minimum order would be a half pound at J$2500.00. More later on the pricing. On Thursday I got an email indicating the approximate time of delivery and in the afternoon, the front desk at my office called me advising me of a delivery for me. I rushed out and was greeted by an elegant woman, with a slightly foreign accent, with 2 boxes and 2 jars for me. She introduced herself as Pauline Smith with a firm handshake, instructed me to immediately place the still warm and oh so beautiful mushrooms in cool storage, uncovered!, she was careful to admonish. She also said that as a first time customer I was getting two new products to try on one condition, that I give her feedback. 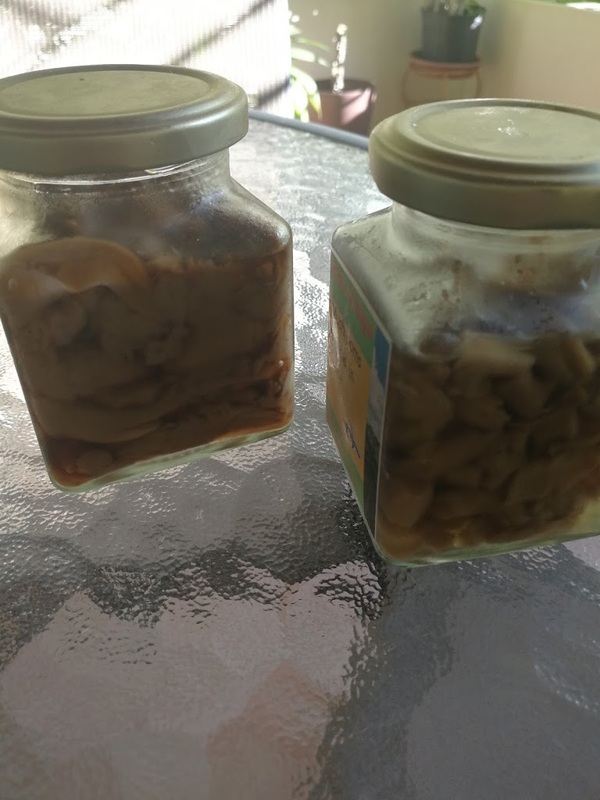 The jars were labelled as mushrooms in bamboo vinegar. I was intrigued. Same label, but two different products I think. One had smaller bits with a firmer texture, and one had larger softer pieces. I asked her to tell me more about this project. She explained that she was part of a cooperative aimed at empowering women and attacking rural poverty. She explained how they had worked to demystify mushroom cultivation and evolve a system where it become a plug and play endeavor. They had developed starter kits, very little land space was required, and that value added products was seen as the real value added side of this industry. Oh wow! I was intrigued. I love food. I love food innovation. And woman empowerment was simply the icing on the cake. Absolutely. I put my treasures in my igloo that I keep under my desk (don’t ask…I do, and it has come in handy on multiple occasions) and on cloud nine, I went home that evening my head swimming with all the ways I was going to enjoy my mushrooms. On Friday evening I decided to have a light supper of lettuce roll ups. I put slices of ham and chicken processed slices in lettuce leaves, added cream cheese, olives, onions, pepper sauce and some of the mushroom pieces pickled in the bamboo vinegar and rolled them up. Delicious! These mushroom pieces were crisp and slightly sweet and went well with the other ingredients in my roll ups. On Saturday morning I tried the preserved mushrooms in exactly the way she advised. 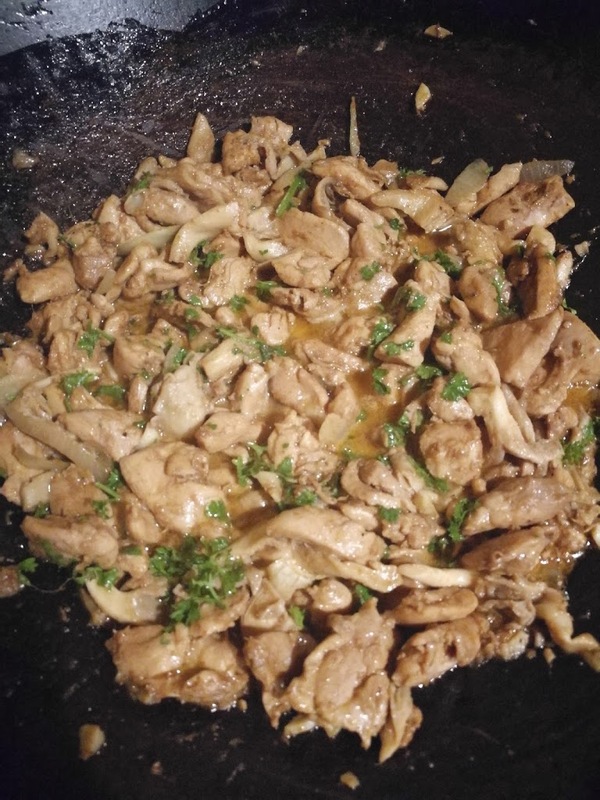 I used sesame oil. 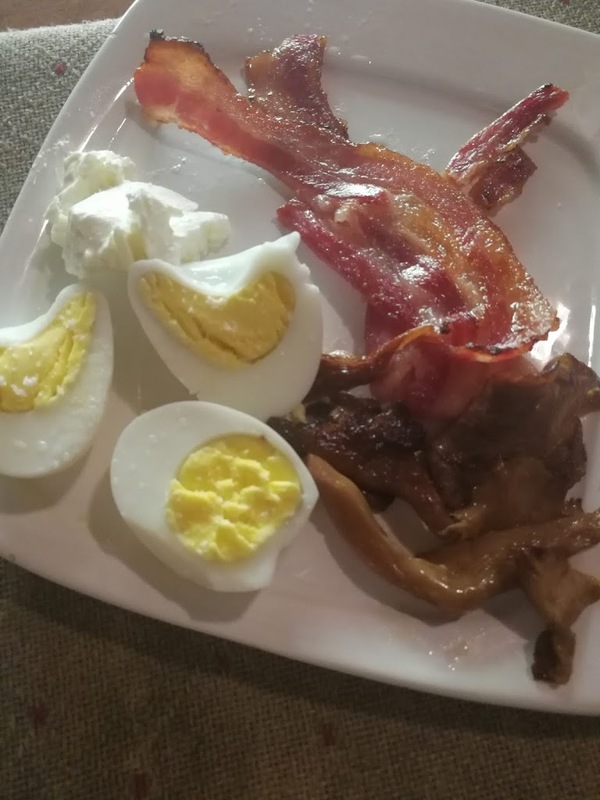 The end result was a meaty, slightly sweet perfect side accompaniment to my bacon and hard-boiled egg breakfast. I imagined that it would also be perfect in a 100% veggie stir-fry creation that included baby corn, onions, sweet peppers and broccoli. Yum! My family concurred. Definitely a winner. 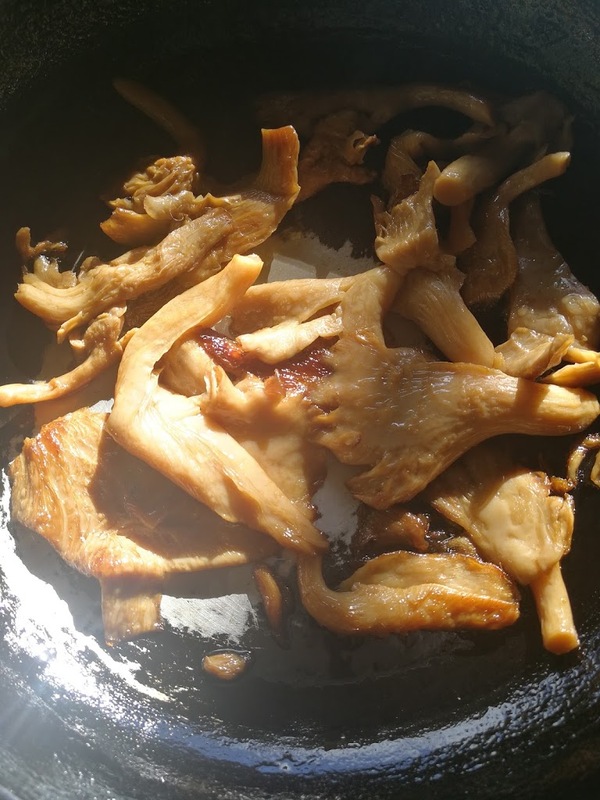 Oyster mushrooms picked in bamboo vinegar, sauteed in sesame oil, a little of the bamboo vinegar added at the end. Don’t mind the shape of my eggs. It’s magic! The mushrooms were a delicious part of my breakfast. For dinner, I decided to make chicken and mushroom in a cream sauce. Perfection! 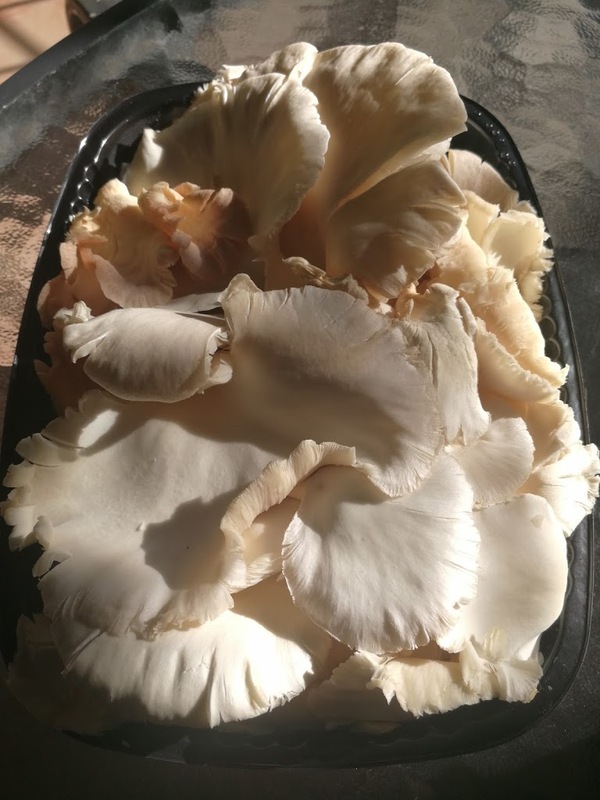 These oyster mushrooms have a meaty texture and they were so fresh and unblemished and unbruised (is that even a word?) unlike the imported options we have that have been cold storage for sooooo long and are soooooo far away from their origins. The end result was a delicious, easy to make meal that we all enjoyed. 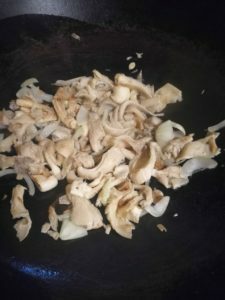 I sauteed the cut up mushrooms with onions in my wok. 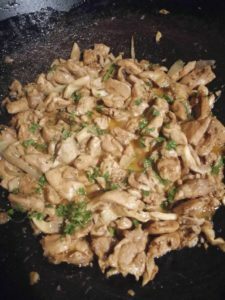 After stir-frying boneless, skinless chicken thighs, I added the sauteed mushrooms and onions. Fresh ginger, loads of fresh garlic, heavy cream, a dash of freshly grated nutmeg and fresh parsley brought it all together. I served the chicken and mushrooms with a garden salad, and stir fried chayote and zucchini. All locally grown. I did a little digging of my own. I visited Pauline’s Facebook page (she accepted my friend request), I visited her cooperative’s website and I read two Gleaner articles on her movement here and here. What I came away with is this: Pauline and her team have a vision. A great vision, that, if realised in full, will see women with an option for economic independence, a new healthy addition to our food options locally, an opportunity for exciting new food innovations with mushrooms as the base, and hopefully an abundance of fresh mushrooms at a reasonable price in supermarkets, so I can enjoy one of my favourite foods with ease. Like so many similar projects, this one seems to have had its problems: in-fighting, funding, support, etc. But they’re still going. Pauline has had her own health challenges, but she’s still going. And they’re working hard to spread the message. 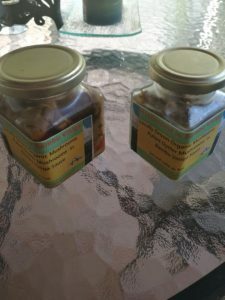 At a recent event at Devon House, they were fully present, selling “grow-kits” to allow people to grow their own mushrooms in their kitchen! I’d love to try that. Now, I work in the food industry…commercial manufacturing and distribution. So I always think commercial viability of any food innovation. Was the J$2,500.00 value for money? Perhaps…these are organic, fresh offerings delivered to my door. I haven’t done the gram for gram comparison with the imported options. And maybe I shouldn’t. But premium-offerings consumers are a niche market, and there is still a mass market out there who think out-of-pocket-spend instead of premium-and-healthy and may be put off by such a huge outlay. The mushroom project will ultimately choose their target demographic and proceed accordingly. I wish them every single success. I have another tray of fresh mushrooms left and I am conspiring to sautee them with garlic and veggies and enjoy. By myself. No easy feat in house of foodies. Selfish? Yes. Without apology 🙂 #causeImworthit.